You still owe me that ten-second car. Neon lights. Spoilers. Ten-second cars. Spinning rims. Tinted windows. Nitrous. Streets that always seem slightly wet. The crowds. The cops. I’ll admit it: I’ve missed this side of Need for Speed. I’ve missed the over-the-top, The Fast and the Furious side of this series. And yes, I do need to specify The Fast and the Furious, as in “the first film in the series.” It’s not just Need for Speed that moved on from the car-modding, underground street racing scene. We all have. Which is why it’s maybe—just maybe—the perfect time to bring it back. I think the last time I really cared about Need for Speed was 2011. That was the year of Need for Speed: The Run’s crazy America-spanning race, and while it wasn’t perfect by any means it was at least a novel concept (in a pre-The Crew world). In 2012 we got Most Wanted, which—while it had some surreal cutscenes—had no real personality. It was a lifeless city with lifeless cars, and suffered next to Forza Horizon’s killer soundtrack and music festival atmosphere. And then 2013 brought us Rivals which was…well, it was pretty much just Most Wanted again except online. And then Need for Speed took a year off. It wasn’t that Need for Speed got bad. Most Wanted and Rivals were perfectly competent games, aside from some PC port issues. But in any case, it wasn’t quality or polish that was the problem. Need for Speed got bland. That’s the only way I can describe it. I played all the way through Most Wanted and Rivals and probably enjoyed myself, but I’ll be damned if I can remember a single notable moment from either game except that Most Wanted featured Icona Pop’s “I Love It,” and that song is great for racing games. 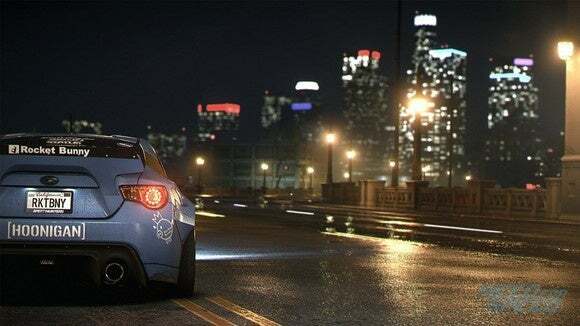 All this to say: What I’m most excited about with Need for Speed is it has some sort of personality. I don’t know whether it’ll be good—the E3 trailer made me cringe. It’s the same sort of faux-street talk that made The Crew ‘s story a grind, in fact. But I admire Need for Speed for distinguishing itself again—even if, paradoxically, it distinguishes itself by resurrecting the ghost of its past self. 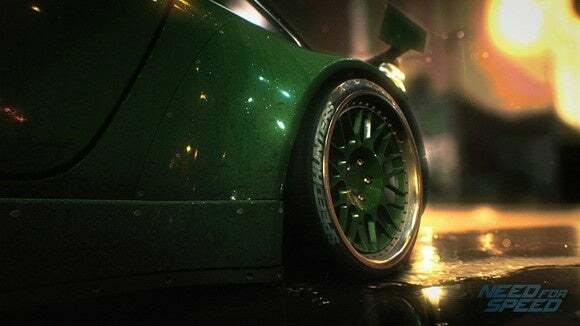 It starts with car customization, which EA made sure to give us time with. We only had a handful of cars to choose from for the demo, but the amount of aesthetic tinkering you can do is impressive. Need for Speed’s really stepped up its game in this department, with dozens of categories and dozens of items per category. Unfortunately I didn’t get a ton of time to mess with the new decal system—I’m curious both whether it finally approaches the level of customization available in Forza (a.k.a. basically limitless) and whether you can share your creations online. One of my favorite parts of Forza Horizon is checking out all the dumb stuff the community’s made. It did bring back that “street racing” vibe, though. Rivals had a bit of that, but the customization wasn’t nearly as fluid and it played it more straight than this new Need for Speed—I think one of the reps in our demo even said you could put a spoiler on a spoiler now? Either someone said that or I was hallucinating from the Los Angeles heat. I don’t know which. I don’t think I was hallucinating. I think someone said it. Also of note: Your aesthetic changes are largely separate from your tuning changes. And I don’t just mean your paint job. For instance, you can change your tires to look however you’d like, but then adjust how much they grip/drift independently. Once we’d finished tinkering we got kicked out into the world for ten minutes of driving. 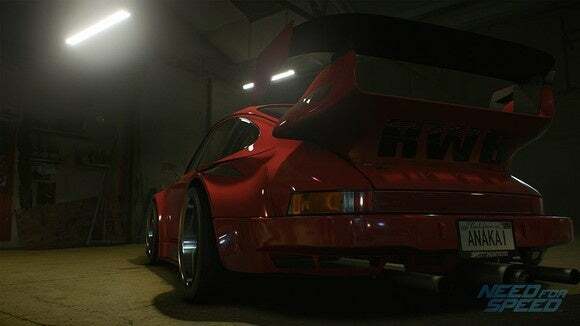 Here, Need for Speed showed off what it’s calling its new “Five Ways to Play” system (FWTP). It’s…not quite new, and more like a refinement of what we’ve seen previously. The FWTP system is key to scoring, at least in our demo (and presumably in the full game). Coming in first is still great, but scoring more points in FWTP—by drifting, by pulling agro on the cops, et cetera—is just as important. Actually more important, for our demo. We had a real-time leaderboard updating with the eight of us playing. I led for most of the round thanks to non-stop drifting, but slipped into second in the last few seconds thanks to someone banking a few thousand points at once. I am struggling with whether this license plate is a Paul Walker reference. If so, well played Need for Speed. It’s an interesting system, albeit one that encourages some strange behavior. For instance, I signed up for an event that charged me with setting the fastest lap time out of a group of contestants. After screwing up halfway through the first lap I realized I could just leave. It would take me precious minutes to finish my busted first lap and try again, so I left the “track” and scored more points by drifting around random corners. 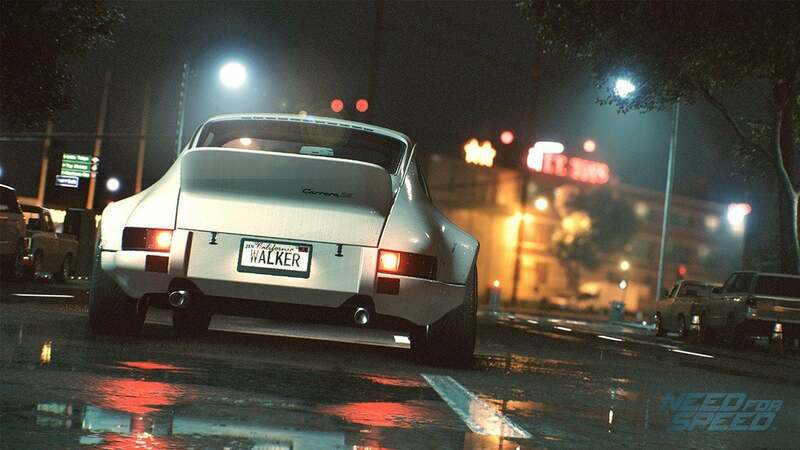 But I really enjoyed driving around Need for Speed, for as little time as I spent with it. It’s got that old Need for Speed: Underground and Midnight Club: Los Angeles vibe. Dark, grimy streets. The dim yellow of old sodium lighting. Absurd cars with absurd aftermarket parts. I don’t know if it’ll displace Forza Horizon as my favorite arcade racer, but I don’t know that it needs to. 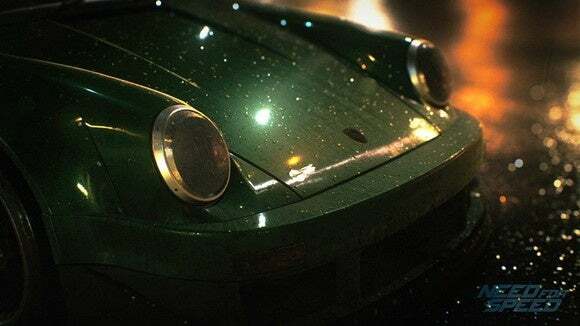 Really, I’m just happy to see Need for Speed making something with personality again.